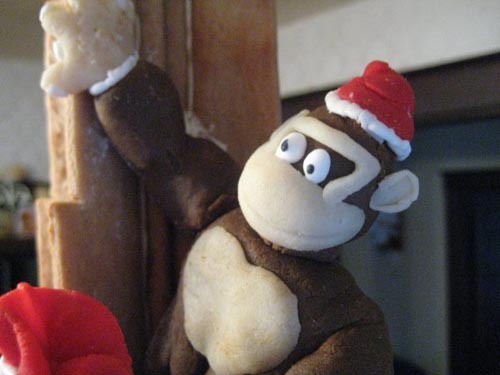 Donkey-Kong Santa made from Marzipan sits atop the building as marshmallow bi-planes circle above. 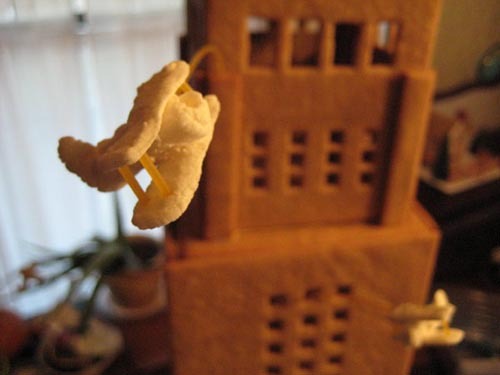 "Marshmallow bi-plane flies by Empire State Building"
Marshmallow bi-plane circles gingerbread Empire State Building suspended by from stick of pasta. 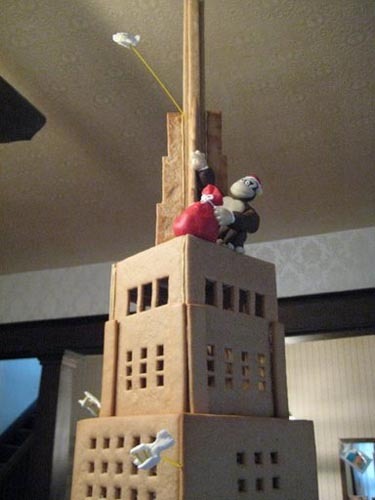 The gingerbread tower looks like a real sky scraper from this angle. 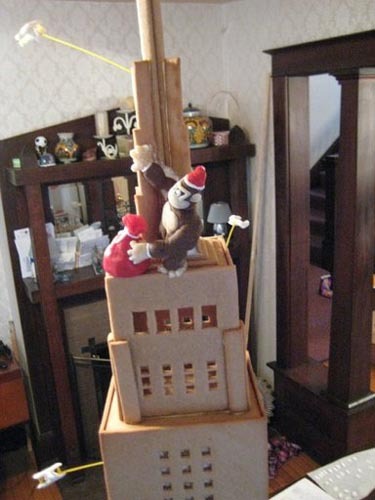 A very jolly ape with a Santa hat climbs to the top of the building. They were made to be viewed from several feet away! "Bi-Planes circle the top of the Empire State Building"
The bi-planes added a sense of motion to the piece. Greg places Red Hots on the base one by one. 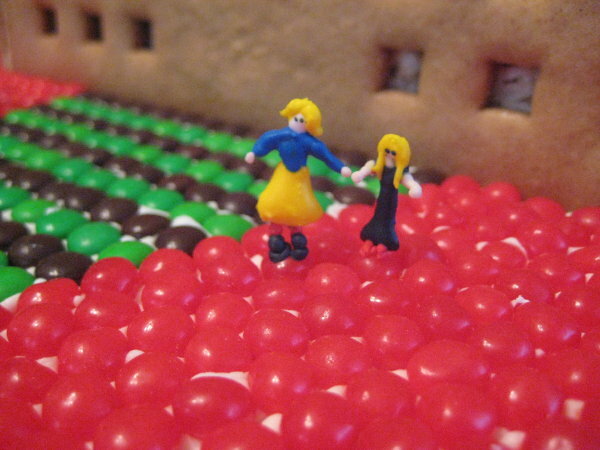 He created a mosaic of color using Red Hots and Mini-M&Ms placed one by one like tiny tiles. 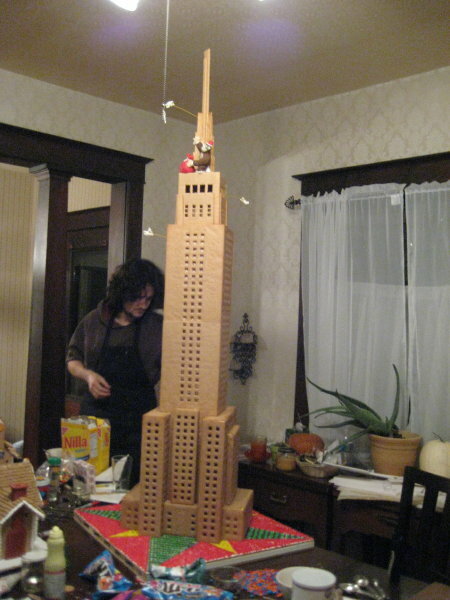 "Construction of the Empire State Building"
"Santa visits the Empire State Bulding." Must be his last stop... Santa's sleigh is empty. 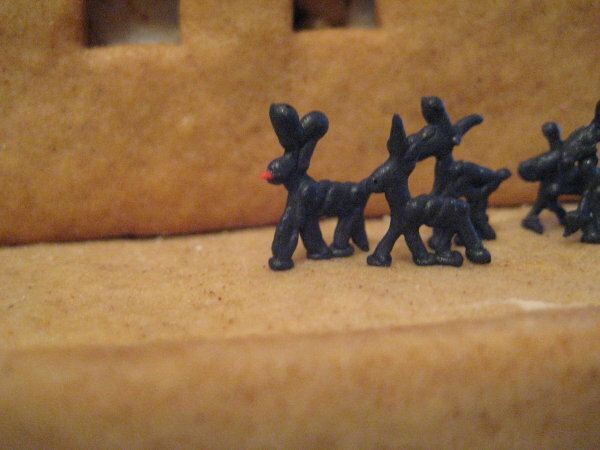 Rudolph leads Santa to the Empire State Building! 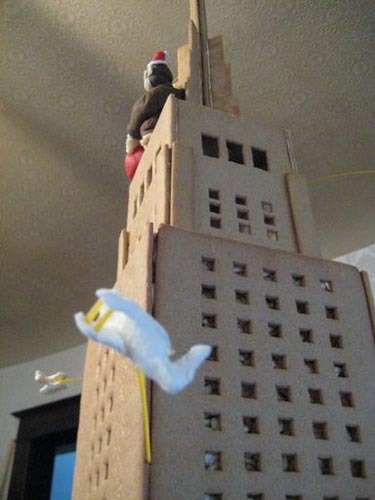 "People spot Santa and Rudolph land on the Empire State Building." 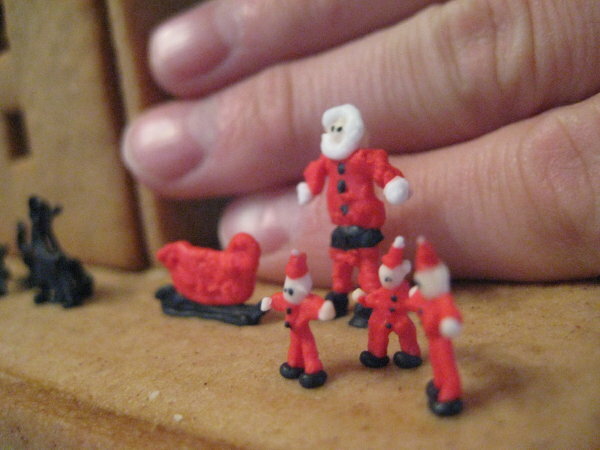 Two TINY Royal Icing people spot Santa! 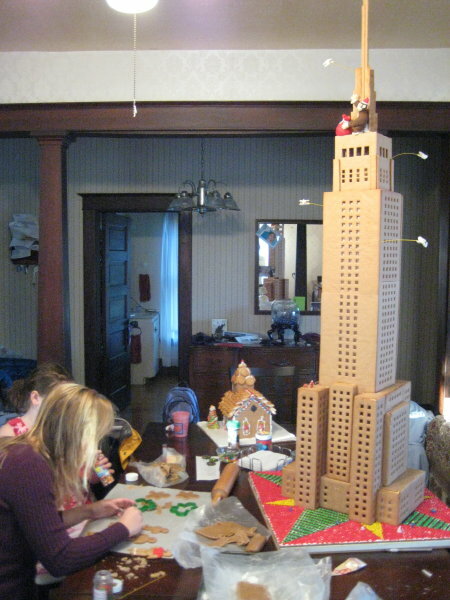 "A girl and her mom walk under the Empire State Building"
The gingerbread house towers over everything in our living room. "On display at the Gingerbread auction"
Tanya Kulaga's family created the 4 gingerbread houses displayed on this table for the auction. 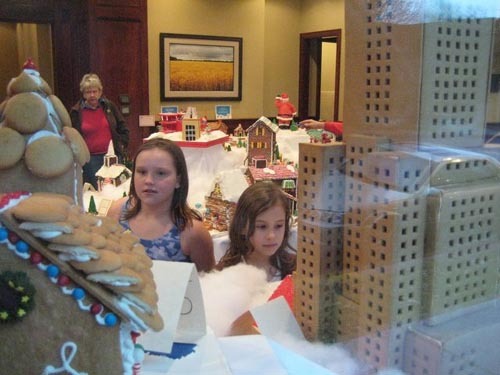 In total the 4 gingerbread pieces raised $6,000 for Douglas County Big Brother's Big Sisters. 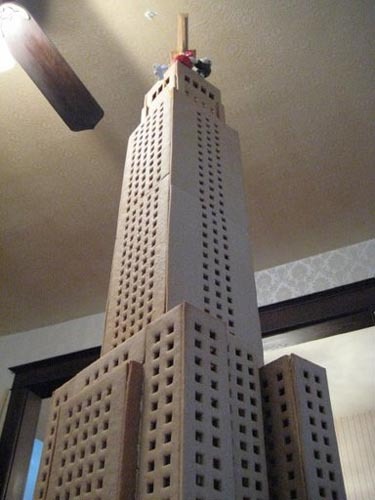 How was the Empire State Building transported? 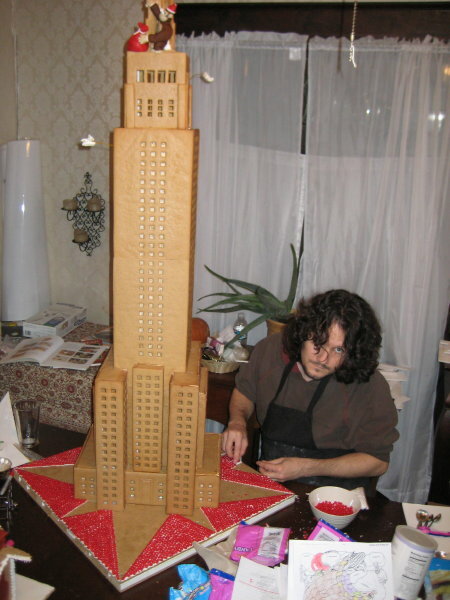 The Empire State Building was designed to "break-apart" into 3 sections. 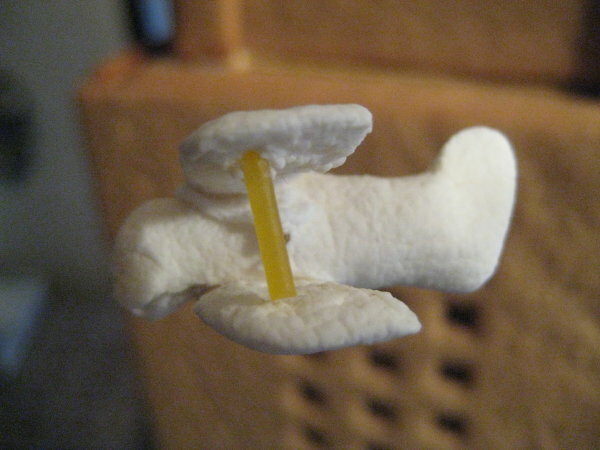 The sections simply "sat on each other" and did not require and additional securing. 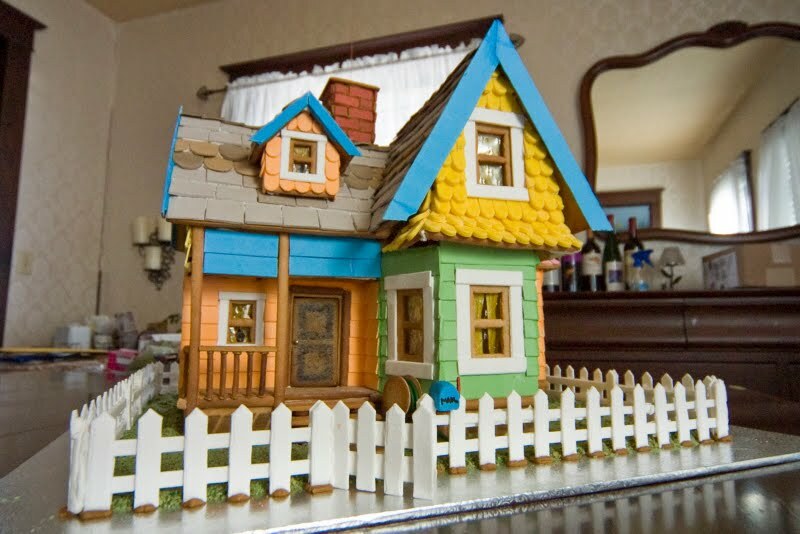 The bi-planes also just pulled out from holes drilled into the structure and the rest of the characters and decorations were secured onto their sections with royal icing and were transported attached. Transportation was a first concern for me when constructing the building and I decided to put some though into enhancing the flat wooden base to help aid moving the structure once it was assembled. Additionally, during the construction I found places where I could "segment" the tower. Ultimately I ended up with 3 sections. 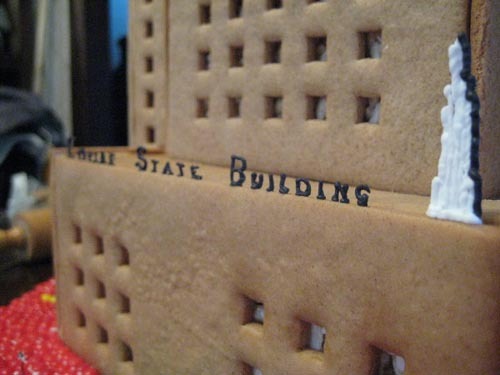 The primary gingerbread section consisted of the wider base of the building plus the longest section of the tower which extended up all the way up to where the main tower begins to "stair step" near the top quarter of the building. The top of the first section is at the bottom of the first and second photos above. This section was about 4' tall in total. The top of this section was unfinished and the rice crispy interior structure could be seen when the section section was removed. The base of the second section was also the "cap" of the primary tower. 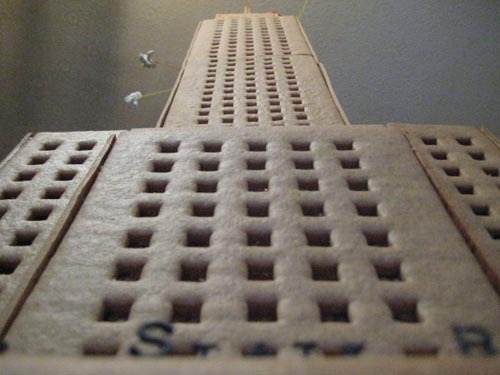 The base of the second section was cut so it snugly dropped into the top of the first section and rested on top of the rice crispy treat interior approximately 1/4" below the top of the primary towers walls. You can see how this worked in photo 1 above. This allowed the walls to hold the second section in place as it rested on the interior structure. This design worked so well, it was not necessary to secure the sections together which allowed them to remain "loose" so they could be easily detached for transport later on. 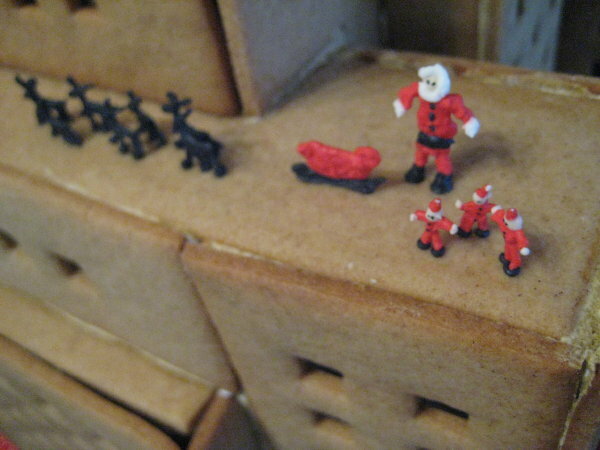 The interior of the second section was hollow but had a ledge of gingerbread 1/4" down from the interior walls for the "top section" to rest on. 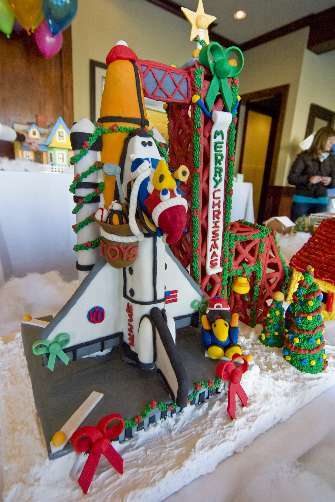 The "top section" was the cap of the second section and included the antenna spire and the Donkey Kong Santa. Again this section simply rested down onto interior ledge of the second section. Again it was not necessary to "secure" the third section allowing it to be removed and re-installed at will. How these sections "married" is also best seen in photo 1 above. To transport the tower to the auction, we called on our friend Sean Williams. I divided the Tower into it's three sections and slid the copper pipes into the wooden base. Moving the tower was quite easy at that point. Sean owns a Mini-Van and fortunately the base section was just short enough to clear the top of the sliding side door of his van by 1/2". This was not by design but by luck... The second and third sections were simply carried out and sat next to the primary section. If the house had not fit into Sean's van, we would have had to find someone with an open bed pickup truck. Hope this helps illuminate how the piece was designed and ultimately transported to/from the auction here in Lawrence, KS. That is simply amazing! 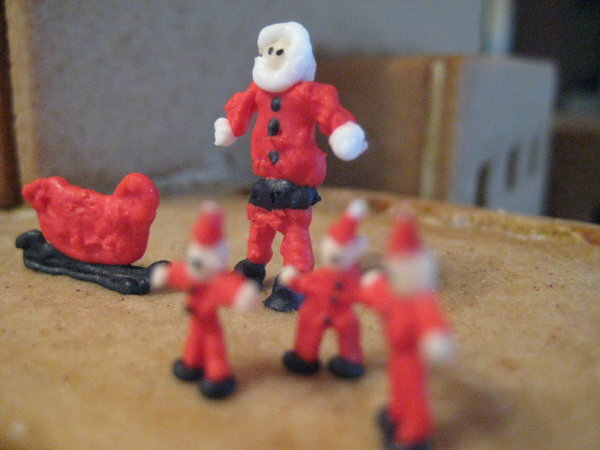 I dread transporting my creations each year. Never thought about making anything too high from pure fear of transporting. Thank you for the break down. This is amazing! 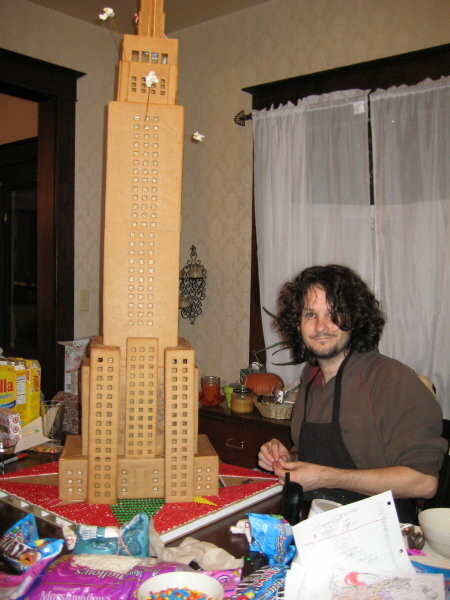 I make a gingerbread centerpiece for a family Christmas Eve party each year... we wanted to make the Empire State Building this year, and I stumbled on yours while google searching for plans. So many good ideas! 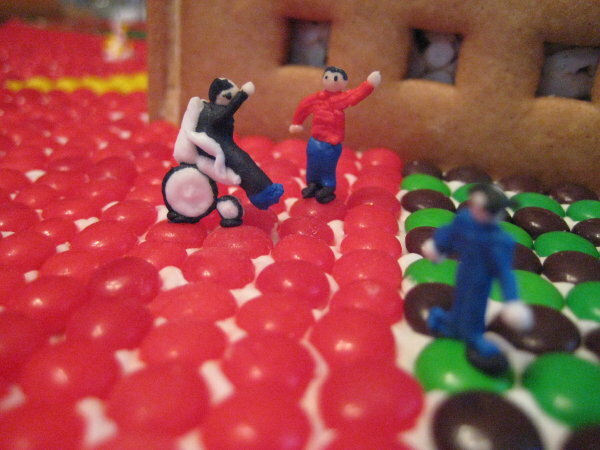 (Ours will be MUCH smaller...) Do you use a standard gingerbread rolled cookie recipe? How did you fit the longest sections into the oven? Are they in pieces and I just can't see the seams? I bought the widest baking sheet I could find that fit into our oven. The cookie sheet is made by Farberware Model# 52152. You can find them online and at Kohl's. There is one horizontal seam in the main tower about 1/2 up. You can see it best on the 3rd photo from the top. The tower sides are stuck to a rice crispy frame so they are not weight bearing. 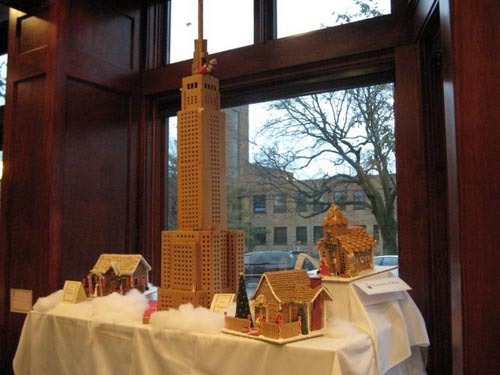 In the 20th photo you can see the right side of the tower, it's the best photo for seeing the 2 approximately 18" pieces of gingerbread that make up the longest sections of the building. Walking around the building, the seams on each side are offset about 1.5" from each other to make them harder to see and break up the seam visually. During the planning phases where I was building my templates, I actually scaled the piece to be as large as I could possibly make it with my oven limitations. I also put a lot of thought into the base, and how it would be moved. I did not however measure the vehicle I was going to use to transport it. Luckily there was 1/2" clearance when we loaded it... very tight but it made it. 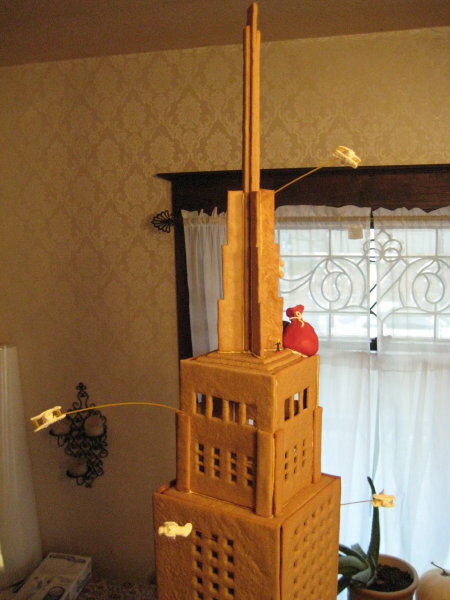 Gingerbread Empire State Building in Lawrence Kansas.